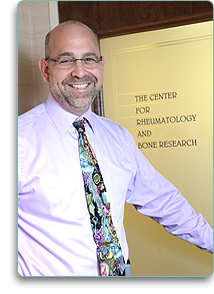 The Center for Rheumatology and Bone Research is a division of Arthritis and Rheumatism Associates, P.C., a rheumatology practice. The Center was developed to give our patients access to the most recent therapies for the treatment of rheumatic diseases through participation in clinical trials. In addition to the physicians, our staff consists of certified clinical research coordinators, administrative assistants, clinical research assistants and in-house recruitment staff, as well as on-site quality assurance and regulatory officers. We began running clinical trials in 1982 and have since participated in the evaluation of new agents for Rheumatoid Arthritis, Osteoarthritis, Osteoporosis, Sjögren’s syndrome, Fibromyalgia, tendinitis and Ankylosing Spondylitis. We remain committed to the evaluation of investigational treatments for all of the rheumatic diseases. Our research center is located in Wheaton, MD, on the grounds of Westfield Shoppingtown Wheaton. The Center is easily accessible by car, bus or subway. Our rheumatology practice handles 30,000 patient visits annually in six locations. We see patients from a wide geographic area that spans from Baltimore, Maryland, to Fredericksburg, Virginia, and from Harper’s Ferry, West Virginia, to Salisbury, Maryland. All of our physicians are Board Certified in Internal Medicine and Rheumatology. They have active teaching affiliations with The George Washington University, Georgetown University and the University of Maryland Schools of Medicine. They provide service to many organizations including The American College of Rheumatology, the American College of Physicians and the Association of Clinical Research Professionals. They actively serve on committees, hold offices and have been honored by numerous professional organizations and institutions. Our physicians regularly are selected as “Best Doctors” in the November issue of Washingtonian magazine as well as “Top Doc” in the Metro DC and Maryland region. A clinical trial is a type of research study. Clinical trials test new treatments and compare them to available treatments (the usual way doctors treat certain health conditions or diseases). The Food and Drug Administration requires clinical trials before a new medication can be approved. Sometimes it is necessary to compare an experimental treatment with a placebo (inactive treatment) when no standard treatment exists. Clinical trials are the engine of medical progress. There is great need for people to take part in clinical trials because that is how researchers learn more about diseases and develop better treatments. Participants volunteer for a variety of reasons. They may be looking for a treatment solution that is superior to their current conventional therapy. They may want to learn more about their own health or take a more active role in their own healthcare. They may not have health insurance and would receive investigational drugs, associated visits, x-rays, and labs free of charge. Or, they may want to help in the search for better health for people in the future. Our trials enable patients and community members to gain access to drug treatments not routinely available elsewhere. How do I know if I have been given all the information I need about taking part in a clinical trial? Before people join a clinical trial, they go through something called the “informed consent process.” This process ensures that as a potential study participant you are given written information about the purpose of the study, the risks and benefits of being in the study; and what you may expect to occur during the course of the study. Once you have carefully read these documents, you should ask questions about words or procedures that you don’t understand. Can I withdraw from a clinical trial at anytime? You can change your mind and leave a study at any time. Remember that being a part of a clinical trial is always your choice. Your relationship with your doctor will not change because you decide to leave a study and your care will not be affected in any way. How can I find out about clinical trials in my area? If you are interested in taking part in a study, call The Center for Rheumatology and Bone Research. The research staff will ask you questions to see if you meet the eligibility criteria for that study. The decision to take part in a clinical trial is yours to make. If you are interested in participating in any of our trials, please contact us at 301-942-6610 or use our Online Request Form. Our research staff will be happy to discuss our current trials and help determine if you meet the eligibility criteria for any of our studies.